including when they should marry and whom--a Quaker in good standing, of course. But if they relinquish the inheritance, it all goes to Tristram Macy, their father's thieving business partner. As Hitty and Henry seek a way to satisfy the will's conditions, they'll be faced with obstacles on every side--and it may be that Lillian Coffin will have the last word after all. 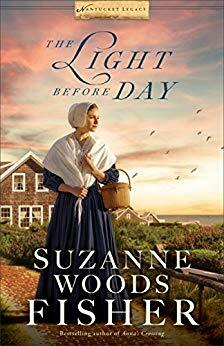 Bestselling author Suzanne Woods Fisher surprises and delights with this story of hope and renewal, love and redemption, arriving just when most needed. I was intrigued by this book. Maybe it was the condition of Lillian Swain Coffin's will or maybe it was the development of the characters. Benjamin Foulger was a handsome young law clerk who was tasked to make sure all conditions of Henry and Hitty's grandmother's will were met. He was so accommodating to Henry's ideas, showed up when least expected and seemed to always be at the Grand House when dinner was served. Grandfather Jeremiah never took to Benjamin. Nobody knew why for sure and he didn't share. Both men were complex although many thought Jeremiah to be simpler than he was. You can't be sure what any man is thinking. Jeremiah Macy was as seasoned cooper and knew plenty about whaling. He had great advice seasoned with the lore of his sea life. "If there's no wind, then row." This simple statement showed up many times between the pages of this story and each time it was used it seemed apt. Had this advice been heeded each time, many troubling events could have been avoided. Good historical fiction is mingled with facts and people who made a difference in that era. Our country was about to face a tumultuous era as the Abolitionist Movement was just beginning. Anna Gardner was a well known Abolitionist Speaker and held conferences on segregationist issues. Including her within the story was well done and fitting for the time and events. Frederick Douglas made his first appearance at one of her conferences. While it took some time for slavery to be abolished, this movement had a an impact on the people of Nantucket who seemed to be a bit separate from the mainland. The Quakers, who are noted for friendship and peace were just as caught up in the issues of the day. I recommend this book for the story but also for the good writing by Suzanne Woods Fisher and her impeccable research. There is a little bit of mystery involved with this story and it will keep you guessing until the story comes to fruition. There is much to read and learn in this book!